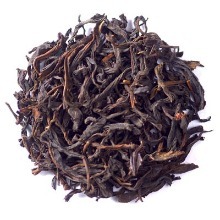 Smoked Lapsang Souchong has been a long-time favourite Black tea in many European countries and America. This tea is treasured for its unique smoky flavor and aroma, which is achieved through drying the tea leaves over pine log fires. Our Lapsang Souchong is the best grade to come from the place of origin of this great tea, Tong Mu Guan in Xing Village, or simply known as Bohea. Many had drank this tea before but only a handful have tried the best grade of authentic Lapsang Souchong from the original farm. This tea is also known as Zheng Shan Souchong. Zheng Shan means "Original Mountain" and only tea leaves picked from Wuyi harvest area can be called as "Zheng Shan". These tea leaves have a special characteristics in that they have a subtle hint of a sweet fruit in China called "longan". True to the nature of a good Smoked Lapsang, this tea is strong with smoky (pine) fragrance and taste. The lingering aftertaste has a somewhat cooling effect on the tongue. Due to the strong smoky nature of this tea, you can only taste the "longan" sweetness in later steepings.